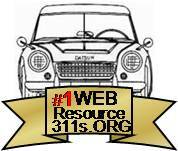 311s.org is your link for all your Roadster needs. The site includes a Discussion Forum and a Tech Section with searchable archives. This site also includes the Roadster Registry, please spend a few minutes and register your ride! The 1963-1970 Datsun Roadster carries many names. To some they are known as Roadsters, others called them by their displacement 'Datsun Sports 1500' (SPL310), 'Datsun Sports 1600' (SPL311), and the 'Datsun Sports 2000' (SRL311)...still others called them by their overseas market name "Datsun Fairlady". It doesn't matter if you simply call them a 1600 or the race inspired 2000, just don't call them extinct. The Datsun Roadster has a following of devoted owners that care and restore these cars from concourse quality show cars, to everyday driving cars that turn heads wherever they go. I first fell for the Fairlady during my teenage years...I owned and restored several Datsun 510's (a cult car in it's own right). The Dime was a teenage boys race ready car (a pocket rocket). At many autocross and race events I attended, I had the rare pleasure of sighting a Roadster. These encounters brought dreams of ownership and the thrill of someday driving the little 2227lbs two seat, dual Solex inducted beast. That was many years ago and even fewer of these lovely Fairlady's are road worthy today. The cars are getting harder to find and slowly Nissan has cut back on part supplies, and the parts that are available can get very expensive. The good news is there are vendors who cater to the Roadster faithful who offer parts to bring back these true beauties of the road. This site will detail the restoration of a 1967.5 2000 Roadster. I will attempt to provide as much detail as possible. My goal is a frame off restoration using info and parts provided by many of the links listed. I am not a purist at heart, so the car will receive personal touches and I will use many parts from a 1967.5 1600 non restorable donor car. Resto The Resto page covers the frame off retoration of my 1967.5 Datsun Roadster. The pictures and text cover the restoration in as much detail as I can provide. Cost Sheets A detailed sheet of parts collected for the restoration with running total and parts sold to fund project (started collecting in 2001!). Roadster Pics Various Roadster Pics. Non Roadster Projects (Poolhouse Project) Stuff that keeps me from working on the Roadstert. For Sale Parts for sale. Tech Data Tech data and specifications for Roadsters. SITE DISCLAIMER-Any information used from this site is used at your own risk-MyDatsun.com will not be held liable for any damages or problems you may encounter.